E.F.R - Test and Tag Ballarat introduces the unigizer that thinks outside the square. Introducing the next generation of energizer for smaller electric fence systems. With a choice of three new models, the Speedrite 1000, 2000 and 3000 can handle electric fence applications up to 18 hectares, or 30 km of multi-wire fence line. Next generation technology means that the E.F.R - Test and Tag Ballarat Speedrite Unigizers can be used as mains powered units or as battery energizers. The result? More flexibility, less fuss. When connected to mains power, the Unigizers are ideal for protecting farm buildings, hay or silage stores as well as electrifying stockyards and small electric fences where mains supply is available. When connected to a 12 volt battery, the energizers transform to provide electric power to remote locations where instant electric protection is needed. The new models are solar panel compatible and have been designed with reliable electric fencing in mind. All purpose Speedrite energizers are the first electric fence energizer to use a unique switch mechanism to control the energizer’s functions. This means no more mechanical switches connecting through the case where water and other contaminants can damage sensitive electronic components. This improved protection means unquestioned reliability - No nonsense, no problem. Speedrite Viper and Delta battery energizers provide dependable power, no matter how remote the location. All models can be used with a solar panel option to create a fully self contained, low maintenance fencing solution. Speedrite battery powered energizers can be used in permanent, semi-permanent or completely portable applications. SOLAR POWER: Speedrite offer a range of solar panels and solar kits depending on your region. To determine which Speedrite solar configuration is right for you, ask your Speedrite dealer. Good pasture control means greater profit. Speedrite portable energizers are designed for intense strip grazing and small to large paddock containment. From self-contained solar to standard dry cell units, you get maximum power, maximum portability, maximum control. UTILITY ENERGIZERS: Speedrite now offer a range of truly versatile portable energizers that, due to their large battery capacity, can be used for medium-term applications without maintenance. Portable energizers allow users to electrify problem areas anywhere on the property for longer time frames as well as the traditional strip-grazing uses. Introducing the next generation energizer for small to medium electric fence systems. Speedrite Unigizer is a universal energizer that can be used as a mains powered unit or as a battery energizer. The results? More flexibility, less fuss. With a choice of six new models, the Speedrite 500, 1000, 2000, 3000, 6000i and 12000i you can handle electric fence applications of up to 40 ha, or 120 km of fence line. The 6000i model comes with a few extra features to display the key factors of fence performance; your earth system, output voltage, battery voltage and earth voltage. The 6000i also features the added benefit of remote capability for those wanting control of the energizer from anywhere along the fence line. The Speedrite S500 integrated solar energizer is a new generation energizer with an integrated solar panel. The most powerful energizer in its class, the S500 delivers high performance even in low sunlight. Fully portable the S500 is suitable for strip grazing and the containment of livestock in small to medium sized areas and offers rugged portability as well as delivering exceptional power output and performance. Speedrite 9000 - A heavy duty solution for large farms and large remote areas where electricity is not available. Provides high performance under extreme conditions. Suitable for control of all types of animals. The Speedrite S250 integrated solar energizer is a new generation energizer with an integrated solar panel. The most powerful energizer in its class, the S250 delivers high performance even in low sunlight. Fully portable with steel and wood post fixing options, this energizer features a stylish, impact resistant case and optional security code settings to deter theft. The S250 is suitable for strip grazing and the containment of livestock in small to medium sized areas and offers rugged portability as well as delivering exceptional power output and performance. Introducing the all new Speedrite S150 - 0.15 Joule integrated solar energizer. The new S150 is the latest development in solar energizer technology. The S150 delivers the same high performance even in low sunlight conditions as the Speedrite S250. Fully portable, the S150 uses the unique mounting bracket that allows attachment to steel posts and wood posts. Suitable for strip grazing and the containment of livestock in small areas this stylish energizer offers rugged portability as well as delivering exceptional power output and performance. The AN90 is the most powerful dedicated strip grazing unit available. Ideal for longer lengths of portable fence. The AN45 is ideal for use on short lengths of portable fence. Includes the same features as the popular AN90. The SG100 combines rugged reliability with 0.1 J performance. Powered by 6x1.5V D cell batteries this energizer charges the fence longer than any other model in its class. With the convenience of 9 or 12V power supply the SG100 gets the job done. The SG50 is the smallest Speedrite energizer. Designed specifically for small fence lines the SG50 is used to protect trees and waterways from livestock damage or, to protect the garden from pests. The economical SG50 uses just 2x1.5V D cell batteries. Performance: Each model delivers among the highest levels of performance in its class with enough power to handle electric fence applications up to 18 hectares or, 30 km of multi-wire fence line. Reliability: With the electronic circuitry encased in a polymer gel the Speedrite 1000, 2000 and 3000 models are completely sealed for the ultimate in weather protection. This means greater reliability without compromising performance. Design: New generation design means that you no longer need several different energizers to meet the requirements of modern farming. Just one will do it all. The new Speedrite all purpose range represents a significant advance in energizer construction and has been designed specifically for smaller farms and lifestyle blocks. Convenience: The new Unigizers provide mains and battery convenience as well as an enviable list of features including a 5 light LED bar showing output voltage and battery condition as well as adjustable pulse speed for improved battery conservation. Each new model also includes a fence lead set, a power adaptor for mains powered installation and a battery lead set. Check fence voltages and find faults fast. This directional fault finder / current meter follows current flow both visually and audibly. 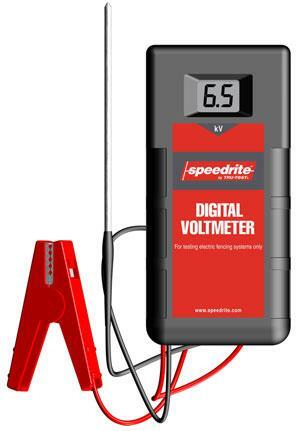 A highly accurate digital voltmeter for testing the most extensive fencing systems. Built tough with solid state circuitry for extra durability. Speedrite's latest innovation, FenceAlert, lets you know from a distance when a fence is not performing. For a trusted electric fencing solution, you can't go past the reliability and performance of a Gallagher mains energizer. Whether you opt for the advanced technology of the SmartPower range; or the solid, steady performance of the PowerPlus range, Gallagher have an energizer that will suit all of your electric fencing needs. Gallagher have a range of mains energizers to suit the unique needs of today's lifestyle and small block farmer. Whether you have a small grazing block with a few cattle or a 150 acre farm lot, Gallagher offer easy to use electric fence solutions, with the added benefit of help and advice from the Gallagher On Farm team.